I have recently downloaded The Runaway Jury by John Grisham. 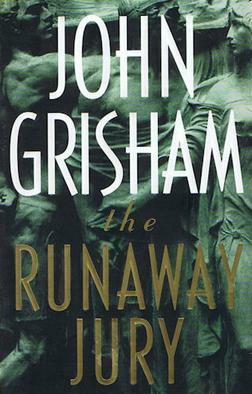 Runaway Jury was the seventh exciting legal thriller novel written by John Grisham. It concerns Wendall Rohr and a legal team of successful tort lawyers who have filed suit on behalf of plaintiff Celeste Wood, whose husband died of lung cancer. The trial is to be held in Biloxi, Mississippi, a state thought to have favorable tort laws and sympathetic juries. The defendant is Pynex, a tobacco company. However a stealth juror, Nicholas Easter, and a mysterious woman known only as Marlee start causing trouble. A shady consultant named Rankin Fitch, is defending the tobacco industry and starts hatching many devious schemes behind the scenes to manipulate the Jury including blackmail, bribary and corruption. Fitch is then approached by Marlee with a mutually beneficial proposal. Meanwhile Marlee and Nicholas Easter and are also attempting to gain control of the jury, by being warm-hearted, sympathetic and very helpful to jurors who might be won over, and rather ruthless to others. Eventually, Easter becomes jury foreman after the previous one falls ill under suspicious circumstances and manages to completely hoodwink and repeatedly manipulate the Presiding Judge, – despite his being a veteran judge and realising the vast monetary interests involved, and who suspects both sides of resorting to underhand methods. Meanwhile, Marlee convinces Fitch that Easter’s agenda is legal however Fitch remains suspicious and is unable to discover Marlee’s real identity. Then Marlee makes Fitch a proposal concerning the trial. Then Fitch makes a shocking discovery regarding Marlee’s background and real identity and the case takes a disastrous turn for Fitch and Pynex….